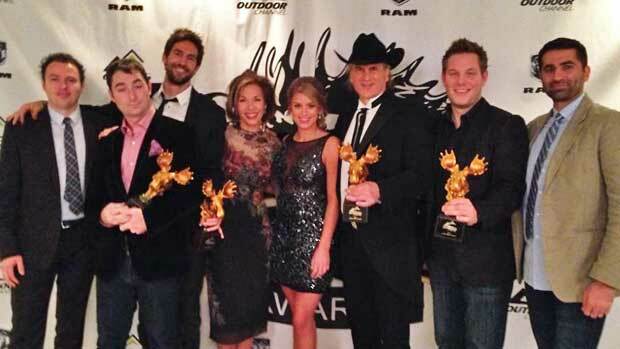 Jim Shockey's The Professionals pose with their four Golden Moose Awards. LAS VEGAS – A new owner means a new direction, and everyone at Outdoor Channel expressed excitement with the heading of Kroenke Sports Entertainment. 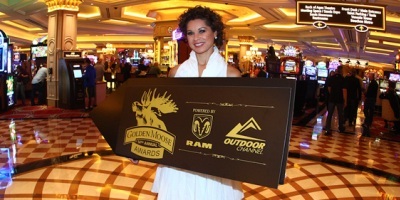 New Outdoor Channel CEO Jim Liberatore opened the 14th Annual Golden Moose Awards powered by Ram Trucks, and he had glowing remarks about the industry and the people he’s met. “It’s my first SHOT Show, and it is awesome,” he said. “Where we’re headed with the new ownership, you really have an anchor owner in Stan Kroenke. These guys are committed, and it’s incredible how dedicated they’ve shown themselves to the network. After Liberatore’s statements, it was off to the order of business – handing out the network’s awards, mixed with humorous and profound moments and good music. Ted Nugent walked away with another Fan Favorite award while “Jim Shockey’s The Professionals” scooped up the lion’s share of trophies. The Professionals won four categories; Sound Design, Videography, Big Game Hunting and Best Overall Production. 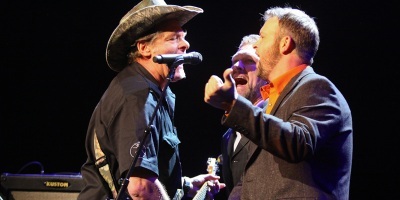 “Five years ago, the Professionals didn’t exist,” Shockey said on his fourth trip to the stage. “Since then it’s truly been like driving a Ferrari, pedal to the metal, full speed ahead. “I want to thank Outdoor Channel for trusting us with the keys to that Ferrari. I want to thank the new Outdoor Channel for giving us the keys, not to a Ferrari this time, but to the biggest, shiniest, fastest rocket ship that’s ever been made. Other big winners on the night were “Crush with Lee & Tiffany,” who won the Fan Favorite Hunting Series and Best Bird Hunting awards. Other Fan Favorite winners were “Chris Brackett’s Arrow Affliction” as Best New Series, “The Bassmaster Elite Series” for Best Fishing and the “Buck Commander” crew of Adam LaRoche, Ryan Langerhaus, Tombo Martin, Luke Bryan, Jason Aldean, Willie Robertson for Best Host. NRA President Wayne LaPierre made a special appearance to present the Lifetime Achievement Award to MidwayUSA's Larry Potterfield.